If you absolutely hate Green Smoothies, then hopefully this post will get you to fall in love with Green Smoothies. What’s so special about green smoothies? It is the easiest way to get the needed servings of fruits & veggies per day. If you struggle with salads and eating your greens, then you might find that drinking your greens is much easier. The immune boosting benefits of of green smoothies means that I haven’t gotten sick as much. Green smoothies also lowers your risk of many health conditions such as diabetes and cancer. Green smoothies provide natural energy without the caffeine. They are quick and easy to make, and best of all they make the best on the go breakfast option. Are you ready to try experimenting with green smoothies for yourself? Here are 5 easy tips on how you can make the best darn green smoothie for yourself. Start with 8-10 oz. of either plain water, coconut water, or your favorite nut milk. My favorite liquid that I like to use is coconut water. I do not recommend adding any kind of dairy to your green smoothies. If you are wanting a creamy green smoothie then add one of the following fruits: mango, banana, peach, apple, 1/2 avocado or papaya. All of these fruits have a creamy texture that will give your smoothie that creaminess your looking for. For a delicious flavor combo blend your base fruits from step 2 with berries or other water rich fruits such as: oranges, kiwi, pineapples, and berries. You can also add in a little vanilla, cinnamon, turmeric, or cayenne to kick the flavor up a notch! You can’t call it a green smoothie without a handful or two of leafy greens! If you are brand spanking new to green smoothies, then start with baby spinach since it has a mild flavor. Other greens you could add are: kale, dandelion greens, chard, collard, romaine lettuce, or parsley. My most favorite green that I add to most of my green smoothies is kale. Blend or pulse for anywhere between 30-60 seconds or until all of the ingredients in your smoothie are the right consistency for you. If your smoothie is too thick for you, then add some extra liquid and blend for a few more seconds to help thin it out. 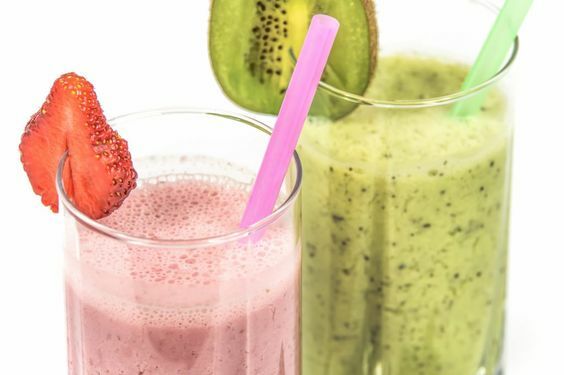 If you really want to make your smoothie extra healthy, then you can add your favorite protein powder, goji berries, cacao powder, chia seeds, or maca. If your not ready to start experimenting and you just want a recipe to get you started, then you are in luck! I am sharing my Peanut Butter Lovers Green Smoothie with you.